Hadrian was born in Spain. His father, Publius Aelius Hadrianus Afer, died rather early (around 85 A.D.) and he was given to be raised by Acilius Attianus and the future Emperor Trajan who was his fathers cousin. Hadrian received the best education offered at the time and as a young man he excelled in his studies and developed his love of literature, art and Greek culture. As a young age he joined the army beginning his service in reign of Domitian where he rose through the ranks and served admirably in the Dacian wars and against the Parthians under Trajan. Hadrian was serving as a legate in charge of the province of Syria when the emperor Trajan fell ill and left for Rome leaving Hadrian in charge of guarding his retreat. He died on the journey back but not before he adopted Hadrian as his heir. With the support of the legions and the acceptance of the senate he took quick measures to remove possible rivals and threats to his power. This being done, he began his long reign cutting his loses in the east deeming it indefensible and moved to suppress the Jewish Revolt most likely caused by persecution brought upon them by Rome that would continue under his reign. Hadrians reign was marked by massive building projects aimed at fulfilling his policy of defense and fortification rather than conquest. He ordered a wall built, which would eventually bear his name, that would span the width of Great Britain. He initiated massive building projects along the Danube and the Rhine as well meant to better fortify the borders of the empire. Although he was well versed in the military and matters of war, his reign was a relatively peaceful and prosperous time for the Empire. His massive building projects were in no way confined to defense. Hadrian was reportedly an avid patron of the arts which led to the magnificent villa and gardens at Tibur (Hadrian's Villa), the Forum of Trajan, and a refurbished Pantheon. Hadrian fancied himself and architect and often personally worked on the designs and managed his building projects. He was well versed in Greek literature, culture and the arts, and he had a long term and well publicized love affair with a young Greek named Antinous who appears in statues erected in his honor. While touring Egypt Antinous fell into the Nile and drowned. Deeply shaken by the loss, Hadrian founded the city of Antinopolis and proclaiming Antinous a god. Hadrian was seldom in Rome because of his travels. Serving in the Roman military he traveled extensively and this did not change once he became emperor. Unlike previous emperors who ruled from Rome seldom traveling save for war, Hadrian took a hands on approach to governing visiting every corner of the empire with a large retinue. As he traveled he gave grants of money, founded new settlements and initiated building projects to improve existing infrastructure or for new building projects. During his reign he visited Britain, Partha, Anatolia, Germany, Nicomedia, Bithynia, Egypt, and Greece among others. 60 years old, his lover and wife dead, and having no children of his on, he named the the unlikely and unremarkable L. Ceionius Commodus as his heir. Commodus fell sick and died soon after so Hadrian turned to his second choice Antoninus Pius but only on the condition that he adopt the young future emperors Lucius Verus and Marcus Aurielus as his successors. 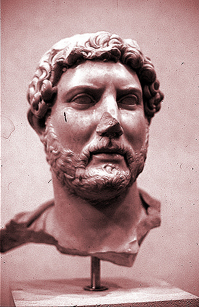 Hadrian died in July 10, 138 at his villa in Baiae in the Campania region of Italy . He was buried in a mausoleum on the western bank of the Tiber in Rome and was deified. Although not universally loved by all, Hadrian is generally considered one of the ‘good’ emperors in that Rome was prosperous, peaceful, and benefited by most of his efforts and his more moderate rule.